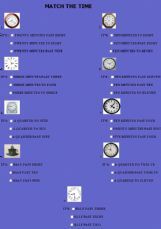 Two videos and some exercises about telling time. 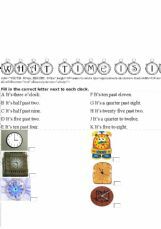 It�s an online exercise for practising telling the time. 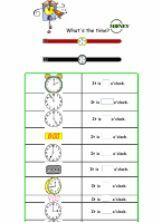 A set of clock to learn how to tell the time! 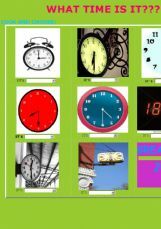 Clock- What is the the time? 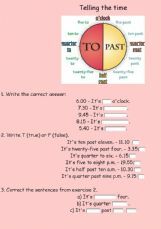 Some reading ,listening and writing exercises to revise the time for beginners. A FUN TEST TO MATCH THE TIME. ENJOY! 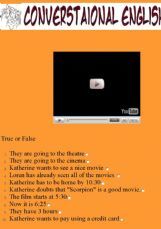 Listen to the converstaion and fill in true and False gaps. 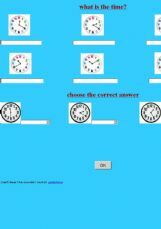 VERY EASY TASK FOR BEGINNERS (ONLY: O�CLOCK AND HALF PAST) HOPE IT�S USEFUL! 1)Watching the first part of the video, Students have to fill in the blanks with the correct answer. 2) Write the time. 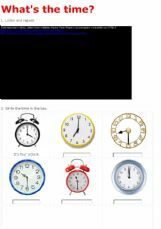 Tell the time using "o�clock" and "half past".